A council has apologised and said more could have been done to inform people about a stretch of roadworks in Bournemouth before they began. 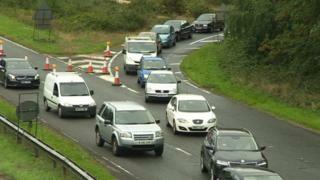 Delays of up to two hours have been reported since work started on the A338 Spur Road on Wednesday. A petition to "fix the broken roadworks plan" has been signed by more than 2,200 people. Dorset County Council's Daryl Turner said the authority was now working with the borough council on the works. The apology follows a special meeting with members of both authorities at the county council earlier. Bournemouth Borough Council, which was initially leading the works - which are part of a £20m scheme, has not yet responded to a BBC request for comment. Following the meeting, cabinet member Mr Turner said: "More could have been done. Dorset County Council has now offered to help Bournemouth council." He said more motorists may have been able to find alternative routes sooner had they been more fully informed. He apologised to those who had experienced delays but described the works as "essential". "It's a very old road and it's deteriorating," he said. He added wait times at the roadworks had since been reduced to 20 minutes. "It's frustrating, I know, but 20 minutes is probably what we will have for the rest of the scheme," he said. An extra lane is being added at the road's Blackwater junction, which serves the airport. Residents, commuters and businesses had urged a rethink to the works, with some describing them as "chaotic", "shambolic" and "unreasonable". Bournemouth West MP Conor Burns previously criticised Bournemouth council for a "sarcastic" comment it made on social media about the roadworks. It previously said it had given plenty of warning about the works which are expected to take nine months to complete.